Congratulations to our 22 business, culinary, and hospitality students who competed at DECA on Jan. 11 at Merrimack College. 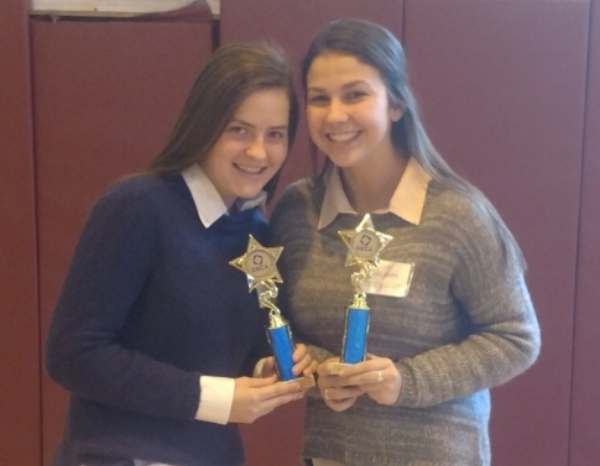 In only their second year of competition with the international organization, Juniors Korin Griffin and Angela Spaulding placed 3rd in Hospitality Services Team Decision Making and will advance to the state competition at the Boston Copley Marriott Hotel, March 8-10. The Whittier Team competed against students from Danvers, Georgetown, Hamilton-Wenham, Haverhill, Masconomet, Methuen, Pingree School, Newburyport, North Andover and Peabody. Students challenged each other in categories such as: Business Services Marketing, Buying and Merchandising, Entrepreneurship, Hospitality, Marketing Management, Retail Merchandising, Sports and Entertainment Marketing, and Travel and Tourism. Kole Haberland, a junior from Newburyport, said he appreciated the real-life practice in marketing. As a competitor in the Travel and Tourism section, he had to create a loyalty program for college students that included a study abroad program and internships, and also targeted athletes. He presented his ideas before a judge who portrayed a college student. "It was helpful to have to think about what I'd really be doing in the workplace," he said. "You have to talk with customers and check in with them and make sure they are satisfied with what you are doing." DECA is an organization that includes thousands of high school and college students and teachers which prepares emerging leaders and entrepreneurs in marketing, management, finance and hospitality. "We are very proud of all the students that participated," said Whittier Marketing Teacher Amanda Crosby. She attended the event with Marketing Teacher Linda Sarno and Culinary Arts Teacher Cathie Baines. Seniors: Estefania Cruz-Aviles, Emily LeBlanc, Alyssa Cerullo, Shaindia Andino, Kim Frias, and Karee Gomez, all of Haverhill; Hannah Dalton of Groveland, and Logan Slevoski of Georgetown. Juniors: Nick Nahid, Alex Alvarez, Korin Griffin, Angela Spaulding, Josmell Ramos Baez, and Keziah Torres, all of Haverhill; Sara Tashjian and Erin Procurot of Groveland, Liam Healy of Amesbury and Kole Haberland of Newburyport. Sophomores: Darby Ortega, Ryan McCarthy, Jake Igoe, and Nylani DeAza, all of Haverhill.